District News For The 2018-2019 School Year, Coming Soon! 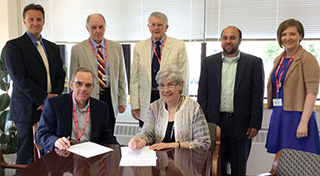 Lynn Business Education Foundation president Greg Ambrose and Superintendent of Schools Dr. Catherine Latham sign a memorandum of understanding, while looking on are, from left, LBEF past president Brian Thomas, treasurer Jack Greeley, executive director Dr. Frederick Cole, Lynn School Committe member Charlie Gallo and Sarah Jackson, coordinator of private partnerships for Lynn Public Schools. 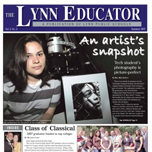 Photo/Story Courtest of the Lynn Item. In a time when municipal budgets are seemingly getting tighter every year, school districts are being forced to think creatively in order to supplement their funding. 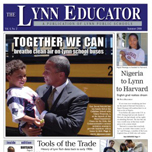 Lynn Public Schools has just aced a test in that regard, with help from a longtime partner. 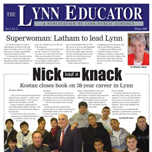 The district and the Lynn Business Education Foundation forged an agreement enabling Lynn Public Schools to apply for private grants whenever foundations and corporations require applicants to have 501(c)(3) status — typically a minimum criterion for such funding. Knocking on those doors will be Sarah Jackson, coordinator of private partnerships for LPS. Among the areas in which Jackson is pursuing grants is STEM (Science, Technology, Engineering and Math). She is working with Rick Held, LPS assistant director of curriculum and instruction for science, to identify private funding and industry partnerships that would connect students with engineers, scientists and other STEM professionals. 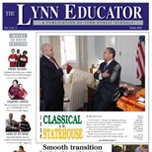 “The district’s new agreement with the Lynn Business Education Foundation places us on a level playing field with other school districts when it comes to fundraising from private sources,” Jackson said. 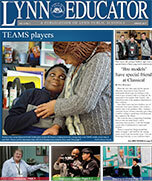 “This is a very big and exciting step for Lynn Public Schools.” Charlie Gallo, chair of the Lynn School Committee’s grants subcommittee, said Lynn is now in a small group of school districts with 501 (c)(3) eligibility, along with the likes of Boston, Brockton, Brookline and Newton. “We are joining a handful of trailblazers in this area,” he said. 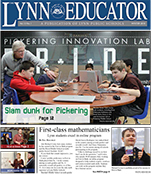 Founded in 1986, the Lynn Business Education Foundation encourages innovation and experimentation within schools by providing resources that result in increased academic achievement. The foundation provides grants and professional development for teachers and career-readiness training for students. 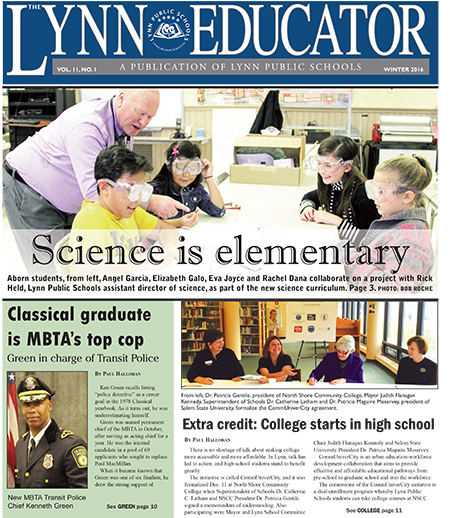 Executive Director Dr. Frederick M. Cole said making the organization’s 501(c)(3) status available to Lynn Public Schools is a natural extension of the longtime partnership with the schools. “Now the schools will have access to potential funding that they did not have before,” Cole said. At first glance, it might seem odd to see the superintendent of schools, police chief and district attorney seated together signing the same document, but it is a yearly occurrence in Lynn, and the parties could not be any more pleased about it. 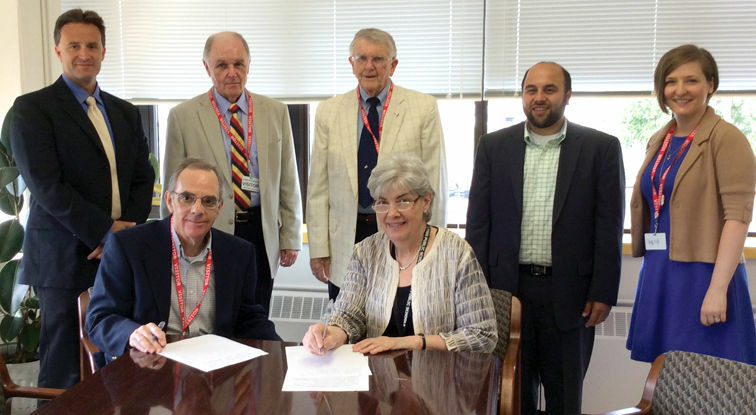 Superintendent of Schools Dr. Catherine C. Latham, Police Chief Kevin Coppinger and Essex District Attorney Jonathan Blodgett gathered in Latham’s office last week to sign a memorandum of understanding. 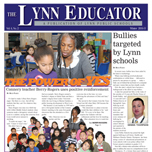 The agreement recognizes the formal working relationship agreed upon by Lynn Public Schools, the Lynn Police Department and the DA’s office to provide a safe and violence-free educational setting for the city's students. This morning the Department of Elementary and Secondary Education announced statewide MCAS results and status updates for each of the 34 schools that entered Level 4 status in 2010 as part of the first cohort of Level 4 schools. Of those 34 schools, 14 have exited Level 4 for a lower status, 15 remain in Level 4 status and 4 are under consideration for Level 5 status. I am truly pleased to announce that both of Lynn’s Level 4 schools will be exiting Level 4 status. This is truly exciting and rewarding news. For the past three years, administrators, teachers, students and staff have been working tirelessly to implement a strategically focused Turnaround Plan to improve the conditions in the schools. As a result, we have experienced significant gains in student performance. We are all committed to ensure that the conditions at the school are not only sustained but continue to improve so that all of our students receive the education they deserve. Although I am well aware that we cannot sit back and relax, and I can guarantee that our work will and must continue, we have certainly reached a milestone that deserves to be celebrated. We would never have attained this milestone without the strong support of so many: our Mayor who has provided funding for resources and staffing, the School Committee who fully supported our efforts in these and all of our schools, the Lynn Teachers Union who is firmly committed to the stability and support of the faculties, and the many community agencies and partners who joined us in our efforts. 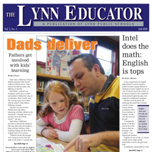 Extensive and crucial support for this success has also come from the district staff of the Lynn Public Schools. Congratulations go to Principals Deb Ruggiero and Mary Dill, their faculties and staffs and, of course, their students for their outstanding academic work and their families for encouraging that work. All other individual school and district results will be publicly released on Friday. BOSTON — Superintendent of Schools Catherine Latham became emotional even before she took to the podium as one of 13 featured speakers during a School-Based Health Center Briefing at the State House. “It’s hard for me to talk about this,” she told a crowd of approximately 100 people gathered for the event. Latham said it is hard for students to concentrate when their ear, teeth or throat hurt. “Or when you’re called worthless by a family member before you leave for school in the morning, or you’re beaten or abused,” she said, her voice breaking. The Lynn Public School District has submitted a letter of intent to the Massachusetts Department of Elementary and Secondary Education to apply for funding through the 21st Century Community Learning Center (CCLC) program. If granted, funds will be used to support additional learning time at Thurgood Marshall Middle School beyond the regular school day and year. The purpose of the federally-funded Massachusetts 21st Century Community Learning Centers (CCLC) Grant is to support additional learning time for students in grades K-12 before and/or after school and during the summer that provides creative and engaging academic enrichment opportunities that will help to address college and workforce readiness and success. 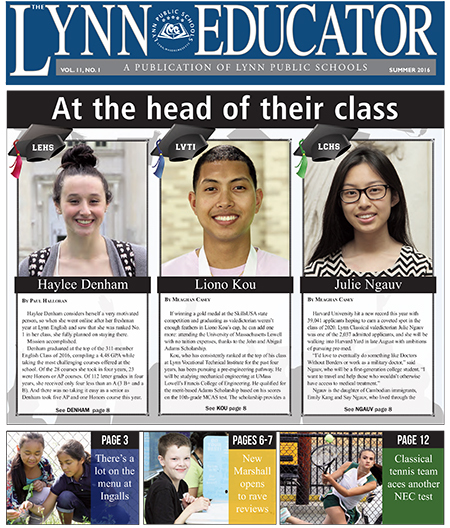 Questions or public input about the proposed 21st CCLC Program may be directed to Dr. Jennifer Wu, Wraparound Zone Program Specialist for the Lynn Public Schools, by phone at 781-477-7220 x3183 or by email at wuj@lynnschools.org. Lynn Enlish High freshman, Ashley Blake, is one of Lynn’s “Student Ambassador’s” for Gov. Patrick’s youth-based outreach organization, entitled Project 351. In remembrance of 9-11, Project 351, in coordination with the MA Military Hero’s Fund, is collecting donations to send care packages to our troops overseas. Each care package costs $13.00 to ship, and Ashley has made it her project commitment to collect monetary donations. Other Project 351 student ambassadors throughout the state are accepting items going into the care packages, as well as additional monetary donations. Checks should be made out to: Mass. Military Hero’s Fund, and can be mailed to: Lynn English High School | 50 Goodridge Street | Lynn MA 01902; attn. Ashley Blake, Project 351. You may also drop off your donation in person to the school office, in a clearly marked enveloped, anytime during normal school hours. Donations will be accepted until Friday September 7, 2012. Summer elementary school attendance is showing slight gains over low 2011 figures, said a top school official who stressed the importance of year-round attention to academics. Deputy School Superintendent Jaye Warry said "excellent" attendance this month by students enrolled in the Cobbet and Harrington schools tentatively points to attendance improvements in the public schools' summer program over last year's numbers. Regular academic year school attendance tops 95 percent, said Warry, but summer school attendance by elementary schools students was 70.2 percent in 2011. "Last summer, attendance at elementary schools was not really good. We've got to get attendance up. The cost of running programs is significant," she said. Warry said about 1,000 elementary school students attend programs in seven schools that started on July 9 and end on Aug. 2. Some of the students' parents were encouraged throughout the academic year to enroll their children in the free summer programs. Others, Warry said, attend following principals' conversations with parents after reviews of student tests scores. Janalle Keown's son, Mason, 8, and daughter, Nova, 7, attend Connery School's summer program because Keown wants to give them "a little more of a head start." "Basically, it's a way to keep everything fresh. They will have to fall back on what they learn in school for the rest of their lives," she said. Warry said summer school is a chance for educators to "provide additional support to kids and enrichment," especially in English Language arts and mathematics. "Philosophically speaking," Warry said, she would like all of the public schools' 7,000 students enrolled in summer programs, but she understands many parents view summer in a different light than the fall-to-spring academic year. "Many kids' families travel. Many people feel, 'I want to give my kids a break,'" she said. The School Department turned Brickett, Cobbet, Shoemaker and Tracy schools into regional summer schools this month. Students participating in the summer programs include students from other schools as well as students who attend each school during the academic year. Warry said Ford, Connery and Harrington schools offer neighborhood-oriented summer programs focused on students. Keown's children spent last Friday on a field trip and they divide their summer days between mornings spent at Connery and afternoons participating in city Parks and Recreation programs. "It's a treat for her — he would rather be playing all day," said Keown. Warry said public school officials work closely with after-school providers, including the Boys and Girls Club, the Greater Lynn YMCA, Girls Inc. and Gregg House. Public school teachers are spending time in those programs this summer tutoring students. "This is the first time we've done it. The value is the kids are there and we're providing academic support. Those agencies are strong resources in the city of Lynn," she said. Keown understands the viewpoint of parents who think "kids need to be kids," but she said the Connery summer program gives Nova a chance to be with her friends and gives both of her children an opportunity to learn year-round. "I've seen a great improvement in this school," she said. | Thor Jourgensen can be reached at tjourgensen@itemlive.com. Superintendent Catherine Latham Announces the Appointment of Two New Middle School Principals. Superintendent Catherine Latham is pleased to appoint two new principals, both of whom were vice principals in their respective schools. Ms. Julie M. Louf will be the principal of Breed Middle School, and Mr. Kevin Rittershaus will be the principal of Pickering Middle School. "I am thrilled with our two new principals. Because both have been vice principals in their respective buildings, they are very familiar with their faculties, students and programs and will be well placed to continue the good work in both schools and begin the individualized process of change that comes with a new administration." Ms. Louf received a Bachelor's Degree in psychology from Assumption College, a Masters Degree in Special Education from Salem State College and a Certificate of Advanced Graduate Studies (CAGS) in Educational Leadership from Salem State College. She has worked for the Lynn Public Schools for the past eleven years as a special education teacher, a guidance counselor, and, for the past four years, a vice principal at Breed Middle School. She has extensive experience in data analysis, teacher evaluation, and school improvement planning and has served as an MCAS Portfolio Scorer for the Department of Elementary and Secondary Education. At Breed Ms. Louf directs the School Improvement Planning Team and is a member of the Parent School Council and the Breed Middle School Crisis Team. Her goals for Breed include improved teaching through the development of professional learning communities, a renewed focus on program evaluation, further use of student data to improve instruction, and continued attention to school climate and community building. Mr. Rittershaus received a Bachelor of Arts Degree in English from Salem State College and a Master of Education Degree in School Administration from Salem State College. He has worked for the Lynn Public Schools for the past sixteen years as an elementary music teacher, middle school English teacher, middle school athletic director, curriculum and instruction lead teacher and, for the past five years, as the vice principal at Pickering Middle School. Mr. Rittershaus has also served as an adjunct instructor at North Shore Community College. He has extensive experience in English language arts curriculum development, school improvement planning, and staff development planning and implementation. His goals for Pickering include increased focus on classroom instruction and the Common Core. Superintendent Catherine Latham Announces the Appointment of Three New Elementary Principals. Superintendent Catherine Latham announces three new elementary principal for the Ingalls, Aborn and Washington Elementary Schools. "The candidates were, without exception, extremely strong, making the decisions difficult; however I am very pleased with the results. Our new principals are all highly recommended, experienced educators with strong leadership and interpersonal skills and a love of children. All three bring a wealth of experience in curriculum and instruction to their schools." Although all will begin this summer, exact dates differ due to previous professional and family commitments. Irene Cowdell has been appointed principal of the Ingalls Elementary School. 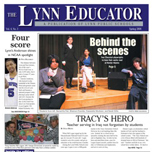 Irene has been employed by the Lynn Public Schools since 1998. She has held various teaching and leadership positions including curriculum and instruction teacher, Reading First Literacy coach, and classroom teacher. She has worked at both the Harrington and Ingalls schools. Prior management experience includes a position as Director of the House of the Seven Gables Settlement. Ms. Cowdell has a Bachelor's Degree from Salem State College in the area of Elementary Education/Sociology, and a Master's Degree in Reading Education from Salem State College. She has completed training at the National Institute of School Leadership and was a Principal Apprentice at the Commonwealth Leadership Academy during the 2011-2012 school year. Irene has conducted widespread professional development in the areas of literacy, use of data to inform instruction, and writing. Ms. Cowdell resides in Lynn. Ms. Patricia Muxie has been appointed principal of the Aborn Elementary School. Ms. Muxie has been in the field of education since 1983. She comes to the Lynn Public Schools from Melrose where she most recently served as that district's curriculum director. From 1994-2001 she served as the principal of the Decius Beebe K – 5 School in Melrose. During her career she has taught at every elementary classroom level from grades one through eight. Highlights of her work in Melrose include implementation of the Atlas Curriculum Mapping Process, as well as a procedure for identifying gifted and talented students across the district. While under her leadership, the Decius Beebe Elementary School achieved the highest ranked MCAS results in the district. Ms. Muxie has a Bachelor's Degree in English and Elementary Education from the University of California at Irvine, and a Master's Degree in Curriculum, Instruction, and Administration from Boston College, Chestnut Hill, MA. During her studies at Boston College, Patricia served as a Supervisor of Student Teaching. Ms. Muxie resides in Melrose. Mr. John Licorish has been appointed principal of the Washington Elementary School - our planned Science, Technology, Engineering and Mathematics (STEM) Innovation School. John has been in the field of education since 2001 and has spent his entire career in Boston. Most recently he has served as the Math and Science Coordinator at the Smith Leadership Academy Charter School. Prior to that assignment, John served for six years as Assistant Principal at the Young Achievers Science and Math Pilot School, part of the Boston Public Schools district. John brings great experience in the areas of mathematics and science instruction. One of his greatest strengths is in data analysis. He has led data analysis teams to utilize data to inform instruction and academic programming. He has also developed math and science programming, spearheaded a "Saturday Academy", and takes pride in establishing great school culture among students, faculty and parents. John believes that a high quality public education has the power to transform lives. He is therefore very excited to join Lynn Public Schools as the Founding Principal of its first innovation school. John holds a Bachelor of Science Degree from Boston University College of Engineering, and Masters of Arts in Teaching from Simmons College. Mr. Licorish resides in Boston. May 24th 6 PM at Breed Middle School MS/HS Band, Symphonic Orchestra, Jazz bands. In addition the Music Department will be receiving the "NAMM" (national Association of musical merchandisers) award recognizing the Lynn Public Schools as one of the"Best Communities for Music Education" in the United States. A representative will be flying in from New York to issue the award. School administration, City Hall, City Council, and Statehouse representatives will be there along with principals and parents of course. This will be a jam-packed standing room event only. Lynn’s artistic community has a lot to celebrate, and Lynn Arts is hosting just the event to do so. "Celebrating the Arts” is a three-gallery exhibition featuring the artwork of K-12 students from all 24 of Lynn’s public schools. Each school selected 15 – 20 pieces of student artwork that aligned with the National Common Core standards. Works include painting, photography, printmaking, sculpture, digital art, folk art, crafts, and more. This same event will also serve as a celebration of Lynn’s designation by the Massachusetts Cultural Council as a Massachusetts Cutural Center. Finally, this evening is also the perfect chance to admire the newly completed mosaic mural installed on the Lynn Arts building. Lynn Secondary Students completed the mosaic in collaboration with Lynn Arts resident artists David Fitcher, Yetti Frankel, and Joshua Winer. Please join the artists on Tuesday, May 29th from 6 - 8 PM to celebrate all three of these fantastic achievements. All events are free and open to the public and take place at the Lynn Arts building, located at 25 Exchange Street, Lynn. www.lynnarts.org for more information. Lynn Classical Senior Named "Youth of the Year"
LYNN — Lynn teen Jonathan Severe credits the Boys & Girls Club for helping him become the man he is today. 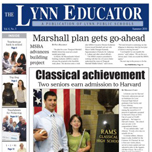 "There are no words to describe what they have done for me," the Lynn Classical High School senior said. The teen has been a member of the club for 12 years now and spends much of his time volunteering there. He was recently awarded the Boys & Girls Club of Lynn Youth of the Year award. "It feels great. It's such an honor," Severe said about the award. "It's such a blessing. I have to thank my family and the staff here. Without them I would have never gotten this award." Currently he serves as the president in the club's leadership group entitled "Keystone Club" by involving himself in serving food at My Brother's Table, collecting clothes for the Salvation Army and organizing park cleanups throughout the community. "It's a really big responsibility," Severe said. "I love doing it though." He is also part of the Touch Club where he influences young Lynn youth to make the right choices in life. He said that volunteering and being an active member of the community was ingrained in him since he was a child. "I was raised on the discipline to help others. It's really just a part of my personality," he said. One of the aspects he loves about volunteering at the club is working with young children. "I love kids. They always put a smile on my face. A lot of the times I walk in and they give me a high five or hug me. It's great," he said. Severe said that while he helps teach kids the right path in life to take, the kids at the club in return have taught him a lot about himself and life. "They have taught me how to have fun," he said. "Sometimes, when you become an adult you forget how to have fun. I look at them and think why not." Severe believes the Boys & Girls Club in Lynn has had a major positive impact on the community. "You always here people say 'Lynn, Lynn the city of sin,' I think the kids here are proving that statement wrong," he said. "The kids of the city of Lynn are the epitome of the future." Severe is planning on attending college in the fall either at the University of Massachusetts or a local community college. He will be majoring in psychiatry. However, he has dreams of becoming an actor or a television host. Saying goodbye to the club is a reality that Severe is not willing to face quite yet. "I'm going to miss all my advisors and everyone here. I have learned a lot of life lessons here," he said. "They have helped me become who I am today. I am caring, smart and energetic because of them." LYNN — A new sneaker and apparel store in Lynn is up and running courtesy of construction and design work from students at Fecteau-Leary Junior/Senior High School. From painting the walls and ceiling to re-tiling the floor and putting up walls, 17 students in Fecteau-Leary's shop class worked for a month and a half on Citi of Sin until its grand opening on March 31. The students spent their class periods working on the store, supervised by their teachers Angelo Meimeteas, Steve Kasper and Duke St. Pierre. Citi of Sin's manager, James Hall, 30, is a teacher's aide at Fecteau-Leary, and his wife, Jenaya Ward, 29, owns the store. "We knew we needed to design the store, and we knew that some of the schools here in Lynn work on trades, one of them being wood shop. We thought it would be a cool idea to make it a school project and make it a community thing," Ward said. Hall said he got approval from the school's principal, Maura Durgin-Scully, and the shop teachers, and then the students and teachers created a design plan. Even during February break, Hall said five students came to help. Freshman John Aparicio, 16, was one of the students, and he said the project was fun and he learned new skills. "I learn more things every time I come here: sheet rock, tile floors, painting," he said. Junior Santos Morales, 16, who also helped during February break, said that he enjoys carpentry work and was pleased with the end result. "I look at it and I say, 'Wow, it looks nice. It looks very professional,'" he said. Meimeteas said it was "amazing" to see the students develop great teamwork, and Kasper said the project gave the students experience at a real job site. St. Pierre said the students took the work seriously. "They took pride in their work and wanted it to look good," he said. Hall and Ward said they also were impressed with the students' work. "If you see the before and after, it's such a huge difference," Ward said. Brickett Elementary's 5th grade class thought they came to Lynn English High School Friday morning to see a play. Instead, they were brought on stage and told they were one of 20 national finalists for Disney's Planet Challenge. Then, Mickey Mouse suddenly came out on stage. That's when they found out they had actually won the grand prize – four days, three nights at Disney World. Donna Whalen's class came up with the project "Think Before You Idle," which was an effort to decrease needless vehicle idling in Lynn. "We are on a very busy street. There's a lot of cars that idle around our school. So we said 'How does that affect our environment?'" Whalen told WBZ NewsRadio 1030. They pushed a local initiative and now cars can no longer idle outside Lynn schools, reducing pollution. "They actually presented it in front of the state legislator to pass a bill into legislation to take idling from five minutes down to three minutes. They created an entire awareness campaign and got the community engaged and it was just incredible," Disney's Christiana Maretens told WBZ.